By Suzanne Kelly. Photos courtesy of Pirate Photography Aberdeen. 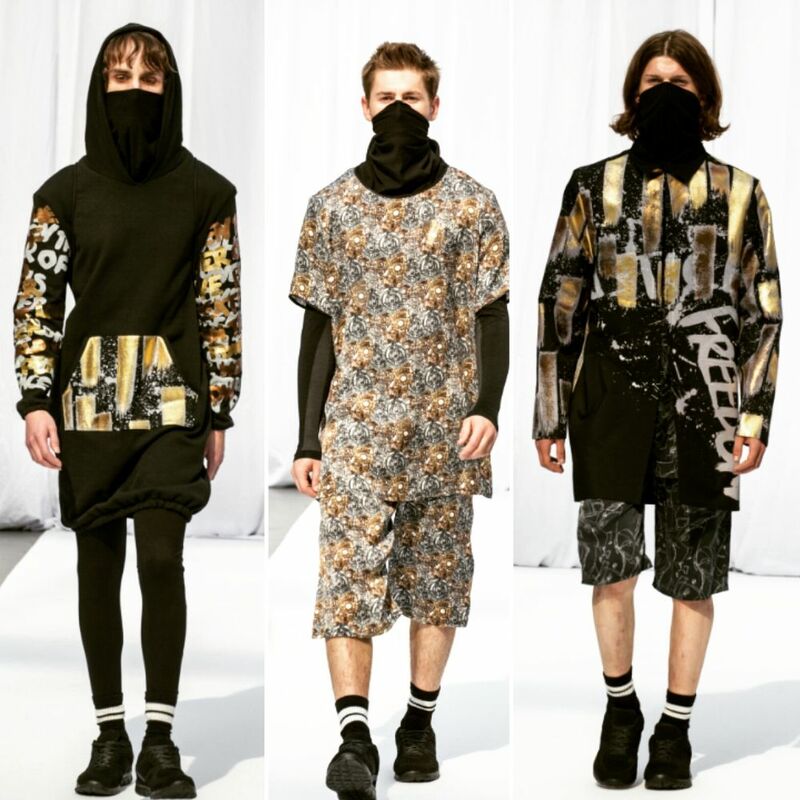 This year’s Gray’s School of Art Graduate Fashion Show lived up to expectations and in some areas exceeded them. 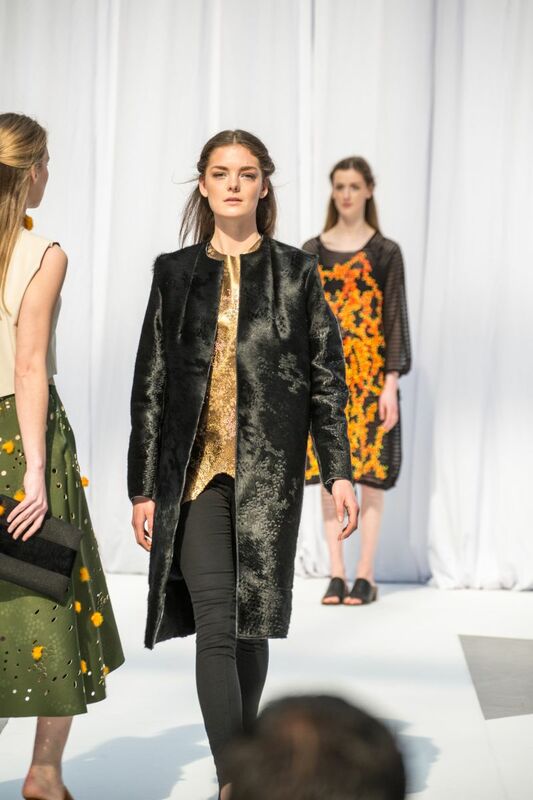 The wide variety of designs on show, the craftsmanship, the wide range of inspirations all made this another memorable fashion event for the school. It is difficult to pick out favourite pieces or designers from such a large field, but here in their own words are some of the designers, with a few comments from me. “My collection explores the current negative affairs in society and visual attributes which connect with this theme. From politics to riots, my collection aims to convey the extent of negativity in our everyday lives. 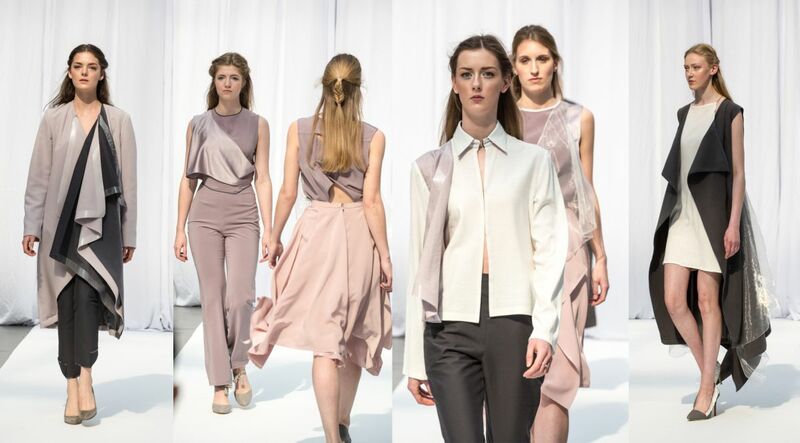 “Gray’s graduate fashion show was a complete success. Finishing my university journey on a high. Nicole brought us a futuristic vision in a collection which echoed social unrest and pending problems throughout – whether directly by slogans written on clothing or via clothes geared to obstruct your face, which I found food for thought in a world where surveillance and social activism are increasing. “The graduate fashion show is a great way to unveil our creations. There is a massive amount of planning and organising that our tutor Salmena undertakes in order to make it a success for us students. “It was great to see it all set up and everything taking place. “Everything is done with precision from the picking of the models to deciding the music for each individual catwalk collection. Natalie made several stunning pieces; a luxurious black coat with very interesting textures in the nape of the fabric was far more stunning than any real fur piece could ever be. It was both echoing dramatic costumes of the past (I thought of a full-length portrait by Holbein of Christina of Denmark) and pointing to the future with its clean lines, flow and interesting textures. 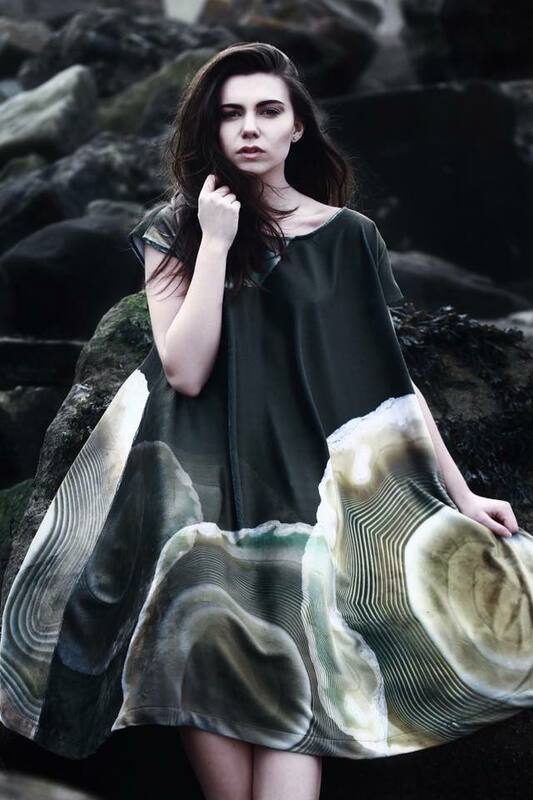 “My collection is the result of a relationship I built between textile design and mineralogy. “I believe very strongly that design and science go hand in hand and hope my work sets an example of how a cross disciplinary project could work between them. “Working with The National Museum of Scotland enabled me to materialise a body of visual and mental research into mineral specimens whilst the facilities at Gray’s School of Art were used to create the garments and textile pieces. Lisa Campbell helped organise the show; I’d seen the progress of her stunning work when I was taking an introductory course at Gray’s. 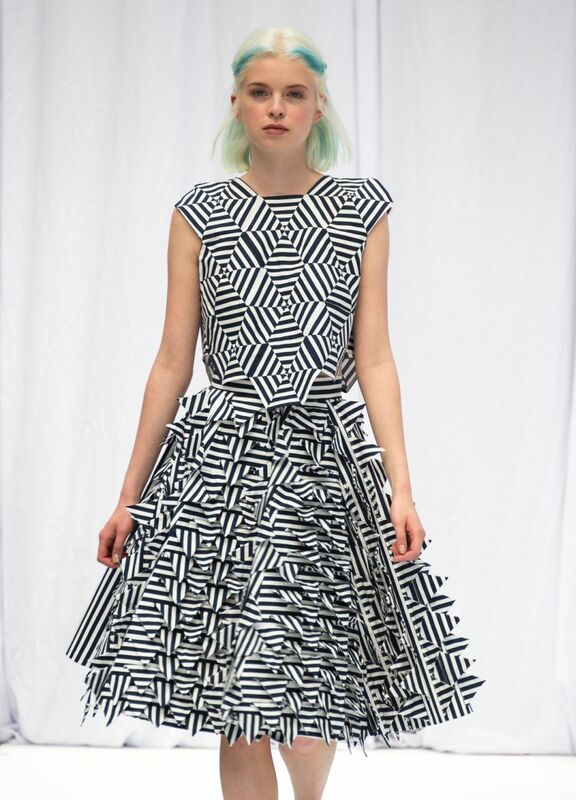 The striking use of origami principles mixed with Op Art has created stunning, unique fashions. “The Fashion Show weekend was an exhilarating experience and I can’t quite believe that it’s all over. “There was a huge buzz of excitement during both shows, seeing everyones collections finally come together and all the hard work finally paying off. “We have received a lot of positive feedback following the fashion show. “The starting point for this collection was femininity and ways of expressing it through contemporary fashion. The focus is on the concept of envelopes being an enclosing structure which contains something personal – in this case the idea of femininity. “Using the conceptual aspects of an envelope (such as triangular overlapping shapes and the shiny strip representing the glue strip which secures an envelope and conceals its contents) the pieces in my final year collection enclose a personal message, trying to find the balance between the feminine and masculine, containing the delicacy of colour in an enclosing structure and expressing the nature of a modern woman. 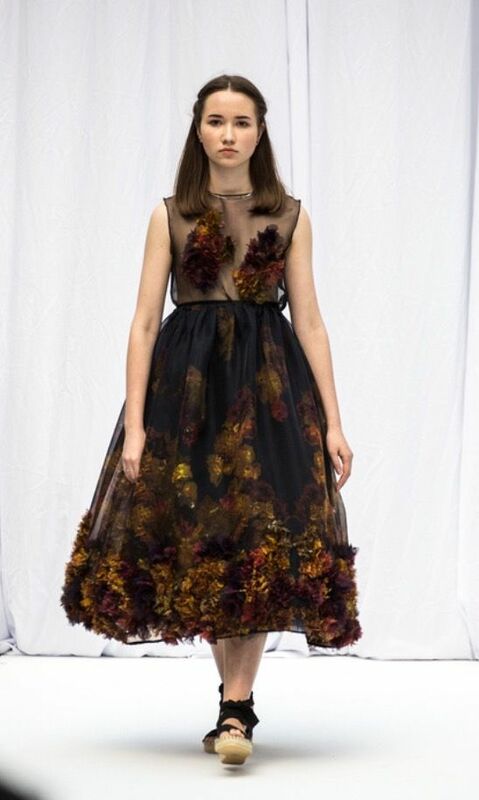 “Decomposition and Decay, my Fashion and Textile collection has been inspired by the decay of florals. Beauty is highly desirable in this day and age. “I feel that we are too quick to discard items because they could be a little past their sell by date. My collection is digital images of dying flowers, that have been manipulated into arrangements to revive them, and make them beautiful again. It’s quite a challenge for next year’s graduating class to equal this work; and we’ll see what they do, and where these talented designers will go – great things are expected of them all.